I’ve seen these issues come around before, but I don’t remember seeing anyone “connect the dots”. First, a reminder of my earlier Tropopause Rules where we saw that below the tropopause CO2 does nearly nothing, but above the tropopause, in the stratosphere, it cools via radiation. In many ways the paper about a 0.1 bar tropopause is just saying the same thing, but for a generalized ‘all atmospheres with SW absorbing gasses’. This Google Books entry lists those shortwave absorbing gases for Earth as being H2O (water vapor), O2 and O3 (Oxygen and Ozone), NO2, and NO3, and leaves out SO2 as it “almost corresponds with the strongest Ozone band”. So basically, water vapor and life derived oxygen and nitrite / nitrate. Note that CO2 is not part of this block of gases. In this graph, you can see that the CO2 band only radiates in the stratosphere. Below the dashed line of the tropopause it does nothing radiatively. Also notice that Ozone is a ‘hot spot’ in the stratosphere as it is absorbing a lot of UV light, and down in the troposphere it is water vapor that’s picking up the heat (and moving it skyward as water vapor is lighter than air and rises to make clouds and rain). A minimum atmospheric temperature, or tropopause, occurs at a pressure of around 0.1 bar in the atmospheres of Earth1, Titan2, Jupiter3, Saturn4, Uranus and Neptune4, despite great differences in atmospheric composition, gravity, internal heat and sunlight. In all of these bodies, the tropopause separates a stratosphere with a temperature profile that is controlled by the absorption of short-wave solar radiation, from a region below characterized by convection, weather and clouds5, 6. However, it is not obvious why the tropopause occurs at the specific pressure near 0.1 bar. Here we use a simple, physically based model7 to demonstrate that, at atmospheric pressures lower than 0.1 bar, transparency to thermal radiation allows short-wave heating to dominate, creating a stratosphere. At higher pressures, atmospheres become opaque to thermal radiation, causing temperatures to increase with depth and convection to ensue. A common dependence of infrared opacity on pressure, arising from the shared physics of molecular absorption, sets the 0.1 bar tropopause. We reason that a tropopause at a pressure of approximately 0.1 bar is characteristic of many thick atmospheres, including exoplanets and exomoons in our galaxy and beyond. Judicious use of this rule could help constrain the atmospheric structure, and thus the surface environments and habitability, of exoplanets. So below 1/10 bar, IR doesn’t get the job done and it is all about convection. I’d also suggest that some details will depend on evaporation, conduction, precipitation… but they are secondary. With less evaporation, you would just get more convection until the heat is moved back up. Which is why we ignore the day at our peril. So right off the bat we can say that for 90% of the atmosphere, CO2 “back radiation” is entirely a non-starter. And in the 10% where it does radiate, it radiates to space, not the surface, as the top of the tropopause stops the shortwave radiation “right quick”. It’s a one way diode for heat to go up the convection escalator and then radiate only to space. Does a very good job of summarizing the paper. In terms of comparative planetology, we have a Figure 2 very different situations: while some atmospheres are dominated by CO2 or N2, other are mainly composed of H2 and He, the lightest gases available with a substantially different chemistry. Distances from the Sun are also extremely variable, causing a broad range of temperatures from the hot Venus to the cold Uranus and Neptune. However, it is striking to note that all of them (well, all except Venus for reason yet to discuss) display a tropopause at very much the same level. But, why this happens? This is the intriguing question studied by Robinson and Catling in their work. For doing so, they developed a relatively simple 1-D model to account for the temperature structure of the atmospheres under very different conditions. This model accounts for the solar and infrared radiation absorption but also for diffusion and convection. However, it is known that the infrared opacity is a power law of pressure. The exact coefficient depends on which kind of absorption is dominant at each atmospheric level. In the higher atmosphere, absorption is dominated by Doppler broadening of the lines produced by the atmospheric constituents (yielding a power of 1), while below the middle stratosphere the absorption is mainly pressure-broadened and collision-induced resulting in an infrared opacity proportional to the square of pressure, regardless of which particular species is absorbing radiation. This model is able to give an analytical expression of temperature and, setting the derivative of this function to zero, it is fairly simple to find not only the minimum of temperature (namely the tropopause) but also the conditions under which such a minimum will develop. I note in passing that a power law with a squared function in it that starts of 1/10th the total is going to be very effective rather quickly at stopping IR from penetrating back down against convective rise. Venus has been already stated as lacking a proper tropopause. This is true for the global mean, but not for some latitudes of the planet with a stratospheric temperature inversion, where a tropopause can indeed be found. So Venus is only an exception in the global mean. That “over averaging” thing again. Averaging out the parts where it still holds. In the near future, we expect to retrieve spectra of exoplanet atmospheres; assuming a 0,1 bar pressure tropopause can help to determine the surface temperature in a much more accurate way and therefore to determine the feasibility of finding liquid water on them. Now, just a quick note before the next paper / link. It references SED, but does not translate that to words. I believe it means Spectral Energy Distribution. As our sun has just gone a bit quiet and TSI didn’t drop much, but the SED shifted dramatically away from UV, I think this matters. This model was recently used to explain why Earth, Jupiter, Saturn, Titan, Uranus, and Neptune all share a common tropopause temperature minimum in their atmosphere at 0.1 bar pressure (Robinson and Catling 2013). The explanation lies in the physics of infrared radiative transport, and should apply to countless worlds outside the Solar System. Furthermore, the assumption of a 0.1 bar tropopause can be used to help constrain surface pressure or surface temperature on an exoplanet, the combination of which determine habitability. They go into albedo aspects a bit more than I would expect, and cover some other turf too, but one particular paragraph a ways into it caught me eye. Shields, Meadows, Bitz, Pierrehumbert and collaborators used a hierarchy of climate models to explore the effect of the interaction between the parent star’s radiation and the planet’s wavelength dependent reflectivity (from surface ice and snow, and atmospheric absorption) on planetary climate. Their results indicate that planets orbiting cooler, redder (M-dwarf) stars are less sensitive to decreases in stellar insolation (as shown in Figure 2 below), and episodes of low-latitude glaciation may be less likely to occur on M-dwarf planets in the habitable zone than on planets orbiting stars with high visible and near-UV output. This is due to absorption of near-infrared radiation by lower-albedo surface ice and atmospheric absorption by CO2 and water-vapor. However, at the outer edge of the habitable zone, high levels of CO2 mask the ice-albedo effect, leaving the traditional limit of the outer edge of the HZ unaffected by the spectral dependence of ice and snow albedo (Shields et al., 2013). Ongoing simulations also indicate that the amount of increased stellar flux required to melt a planet out of a snowball state is highly sensitive to host star SED. We find that a distant frozen M-dwarf planet orbiting beyond the outer edge of its star’s habitable zone without a continuously active carbon cycle is likely to melt more easily out of global ice cover as its host star ages and its luminosity increases (Shields et al., in prep). To me, this seems to indicate that SED matters rather a fair amount. Shifts of SED can shift habitable zone of the orbit space, and it can change how hard or easy it is to exit an snowball state. We, not being around a redder dwarf, will be a bit more sensitive to SED as it interacts with surface albedo such as ice and snow. As I read this it is focused on red dwarfs, so I’m less clear on how this applies to our yellow medium sized star with a load of UV. But it is pretty clear that shifts of UV vs IR matter, potentially a lot, and interacts with ice cover and water vapor and oxygen content. It also seems to say that high levels of CO2 (though it doesn’t say what those are) can mask the ice-albedo effect. So, since IR is absorbed by the ice, having more CO2 means the ice is less likely to melt? Do I have that right? This entry was posted in AGW Science and Background, Science Bits and tagged Atmosphere, Global Warming, SED, Solar, Stellar, Tropopause, Troposphere. Bookmark the permalink. I share Chiefio’s enthusiasm for the Robinson & Catling atmospheric model. It works well on all the bodies in our solar system with significant atmospheres with the exception of Mars which manages to have a tropopause even though the atmospheric pressure is less than 0.1 bar. It would be hard to improve on the above statement and now R& C have delivered a model that quantifies it. I also share Chiefio’s enthusiasm for the intrusion of science into the AGW fable. I think this also ties in with the Nikolov and Zeller,/ Loschmidt et al discussion about temperature gradient (ie surface warming by lapse rate) being explained substantially by the gravity of a world and its atmospheric mass. Those two values in effect will define how high in the atmosphere that 0.1 bar top of troposphere will be and hence the altitude of the effective radiating surface of the planet to space. Then due to lapse rate for that atmospheric mass and gravitation you would in effect define the magnitude of the surface warming of that atmosphere. This now defines a probable mechanism for that gravity, atmospheric mass relationship and its relationship to surface warming. I have hypothesized several times that the key was not the so called gravitational warming that people try to dismiss out of hand, but that the conservation of energy due to gravitational potential energy would define the lapse rate seen in a convective atmosphere and the atmospheric mass and gravity would define the altitude of the effective radiating surface of the atmosphere to space (the 0.1 bar surface more or less). Once you define the radiating surface altitude then you necessarily define the surface warming due to the lapse rate seen in the convective layer below the tropopause. There are other encouraging signs that federal research agencies and mainstream research journals are moving away from the AGW fable to acknowledge the pulsar-centered Sun controls the solar system. Thunder bolts may thus begin in the Sun’s pulsar core if that is the source of cosmic rays. Chefio, would you be interested in helping the GWFP with an Enquiry in to the state of the current Temperature datasets? Good “tie together” there. Kind makes the whole picture nicely. Thanks for the link. I’ll hit it sometime tonight. Do not forget that molecular oxygen absorbs in the visible and ‘near’ IR as well. There is a reason why liquid oxygen and solid oxygen are pale blue in color even when the samples are in grams. Have you seen this new study? Where researchers at Duke University say global warming isn’t progressing as rapidly as it would under the severe scenarios outlined by the Intergovernmental Panel on Climate Change, and for good reason. In reviewing the last 1,000 years of temperature records, researchers found that natural variability in surface temperatures over just a decade can account for increases and decreases in warming rates. These researchers said that most of the variability might happen because of interactions between the ocean and atmosphere, and/or other natural factors. As such, they say trends over just a 10-year period don’t show a lot about long-term warming the Earth can expect to experience over century long periods. Basically it says that the temperature variations are lost in the natural noise, just as some people already surmised. Those ”researchers” of yours are looking for a backdoor exit. Nobody knows what was last year’s correct ”global” temperature; most definitely they don’t know what was 1000 years ago the temp for the whole globe, so that they can compare!. Because people on the street that are not like the fundamentalist from both camps in the blogosphere, starting to realize that the phony global warming is not happening – the ”researchers” are trying to lower the exaggeration. Researchers “are looking for a backdoor exit”, “are trying to lower the exaggeration” are perfectly fine with me. As are those that wish to “revise” their past work and statements, or “back-peddle” on prior results or interpretations of the result. More power to them, I say. Slowly the AGW myth will decay with these actions. I feel a warm glow as each of the past’s nightmare scare scenarios is publicly demolished, crashing down by the application of truth, real science, and logic. So let the edifice of AGW fall and quickly, and any publicity of worthy science helping it to fall, IMHO, is to be applauded. Any such research and their result should get as wide an exposure to the public as possible. BUT: on the second point… you will be disappointed, because: ”the Skeptical research is same as: Christians researching how to prove Mohamed wrong… What I’m trying to say is: ”the Warmist built their fortress, by using the Skeptic’s beliefs as foundation, will never happen, skeptics are born losers; because Warmist are clever cunning thieves. In the stratosphere It is mostly O2 that absorbs solar UV, breaks it into single O molecules that later recombine into O3, releasing heat in that process and being the reason for the temperature rise that starts at the tropopause. So during daytime CO2 warms the atmosphere (and thus cools the surface) a little. WV being lighter than air has (almost) nothing to do with convection. WV is a very well mixed gas. Convection is driven by density differences due to (mostly) temperature differences. See hydrostatic balance and the accompanying pressure and temperature gradient. In tropical storms this is dramatic. Moist air sucked up into a cyclone, then dryer air descending outside the rain belts. A giant water working fluid heat driven heat pump to space. From personal observation, I have a series of photographs taken through the day from sunrise to sunset showing cloud formation at ever greater heights as the mid-west corn belt warmed through the day. Moisture entering the air, it, then, rising into first stage clouds, then get re-evaporate by more sun, only to reform further up. It was a rather remarkable experience to watch this process through the whole day as at least 3 distinct layers of clouds formed with each step upward. You can actually watch the water driving the process as surface dew evaporates making the first rising columns. I have a related set of photographs from the air on a flight cross country. Starting at about Phoenix and going to Florida, tracking cloud density, pattern, and height changes along the way as the average humidity changes. Yes, it is a heat engine, but it is a humidity / water working fluid. It’s really more complex than either of us are saying. (To keep articles from becoming books, something always gets left out…) At some altitudes, latitudes and UV spectra, O3 absorbs and is broken down, at others O2 absorbs (as you describe) and O3 is made. The column of absorbing gas in the path of incoming radiation includes atomic and molecular nitrogen and oxygen and their products. These gases block all short wave ultraviolet radiation. Molecular oxygen in the stratosphere (10 to 48 km) absorbs short wave (up to 242.4 nm from the ground state and with very strong bands from 50-100 nm, and 140-175 nm) ultraviolet and photodissociates. The atomic oxygen produced leads to the production of ozone. 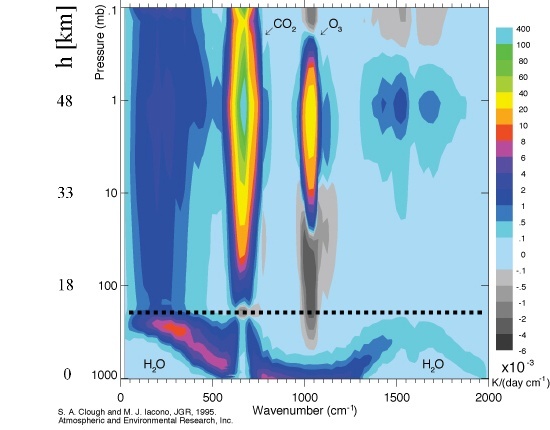 Ozone strongly absorbs longer wave ultraviolet in the Hartley and Huggins bands from 200 – 360 nm (Fig. 1), and has additional weak absorption bands in the visible (Chappius bands from 450 – 750 nm) and infrared. So whenever talking about “UV”, folks are taking a shortcut and have avoided the particular nm bands and their different absorptions and effects. So O2 is the up to 242 nm absorber while O3 is the 200-360 nm absorber. So look again at the big blue square chart at the top. My words are simply describing what is seen. In the Stratosphere, there is a yellow / red ‘lozenge’ next to the CO2 one that has the label O3 on it. It is “glowing” in the 1000 wave number range having absorbed in the 200-360 nm range. Similarly you can see a red blob labeled H2O “glowing” in the troposphere. Once the water reaches a stability height, it condenses as it gives up that heat, condensing out as rain or snow and returning to the surface energy depleted. The dry air that makes it to the tropopause gets sucked off sideways (at near Cat 2 hurricane force!) and begins a dry decent with compression heating in places like the “Desert Southwest”, Sahara, Gobi, The Outback, etc. So my pointing out the O3 hot spot glowing at 1000 wave number was not to denigrate the absorption by O2, but to point out that the energy LEAVES via that O3 (which is also absorbing in the 200-360 nm band and re-radiating that energy too). Similarly, the mention of the water radiation is not to say that the warming of the air does nothing, but rather pointing out that it is the water vapor in the air that rises and radiates away that heat at altitude. In contrast, the CO2 diamond is only radiating above the tropopause, so net cools the atmosphere, and is doing nothing below the tropopause, so is irrelevant to surface temperatures and the 90% of the atmosphere that is below the stratosphere. yes humidity, density and latent heat are the drivers for energetic convection. If you have uniform humidity air, large scale convection never develops into long lived updraft columns only local turbulent mixing occurs. The whole basis of thunderstorm development is due to atmospheric instability due to differences in humidity/tensity in different locations in the atmosphere. At the same barometric pressure, two parcels of air one dry and one saturated will have different densities. The humid parcel will start to rise due to its relative buoyancy. as it rises, it eventually reaches the LCL lifting condensation level where that humidity begins to condense out. As soon at that happens it releases the latent heat of condensation and the parcel of air is now even warmer than it would be without the humidity present. This increases the buoyancy more than it previously had relative to neighboring parcels of air, especially any air parcels which are dryer, and as a result received less warming due to condensation as it was lifted. The result is eventually this establishes an organized updraft of warm moist air which through the heating of condensation and later freezing can develop updraft speeds in excess of 200 mph. A dry world with no significant humidity would be a world with a very stable stratified atmosphere. (of course any condensible vapor will do the same thing even iron vapor on exoplanets who are warm enough for “iron rain” to develop). It is the density differences created by humidity which drive most storm development. In the case of a dry line storm you have one warm moist air mass butting up against a dry air mass of approximately the same temperature. Due to the differences in lapse rates for the two, the moist air does not cool as fast with altitude as the dry air and is buoyant compared to the dry at some altitude. As a result, the denser dry air tries to dive under the moist air mass which lifts it further adding to the density imbalance. Soon you have a strong over turning motion and the development of a rising column of the warm moist air as it explodes upwards due to its ever increasing buoyancy. In a layered atmosphere if the warm moist air is capped by drier air, that can form a “lid” with prevents the moist air from reaching its LCL. If it is lifted by some outside force it will begin to rise due to the self generated heating of condensation if it is lifted enough to cross th LCL. Most any physical disturbance can “break the cap” There is some temperature of the warm moist air which will cause sufficient buoyancy to develop where it will punch up through the dry air layer. This is often the case where massive thunderstorms suddenly blow up out of a clear blue sky. A passing short wave or motion of lower level winds pushing the moist air up a slope or rising due to convergence or simple heating of the surface layers by the sun break this convective cap and suddenly it is like pulling the plug in a sink only inverted, all that warm moist light air suddenly drives upward to get the buoyant layer on top of the denser layer. A volume of air at eg 15C at 100 % relative humidity can contain max. ~1 % wv. Colder air even less. And indeed this 1% makes the volume slightly lighter than the same volume without wv. The difference however is very small. The main factor responsible for the density of air is its temperature. Buoyancy is almost exclusively driven by temperature differences. If you see a cloud, it is not wv (invisible gas) you see, but water droplets forming because the air has cooled below its dew point. These droplets are heavier than air and fall relative to the rising air. A very handy site to check basic meteorological processes. It is not so much that energy has to leave the atmosphere. the atmosphere MUST have a temperature to stay “in the air” against gravity. So it must be continuously heated to stay up. If we really wanted to be precise, we’d say that a gas at a higher energy level, has constituents with a higher molecular velocity. At a given temperature and pressure, the ‘lighter’ molecular weight gases move faster relative to the others, but gravitational fractionalization does not take place in our atmosphere until you get near or are at the top. While water’s nominal molecular weight is mostly 18, water vapor may not be ‘single’ molecules, but actually a mixture of monomers, dimers, trimers, and possible higher aggregates that shift form and adsorb onto dust grains, even before bulk condensation into that lovely aerosol known as clouds, in our atmosphere. I have a nearly 40 year old memory of a statement about water chemistry: “It’s complicated”, if you will. The only other chemistry that I recall being remotely as closely complicated was carbon chemistry, aka organic chemistry; where that complexity lay in the essentially infinite maximum carbon chain length. @ Ben, please define well-mixed. Are we talking small volumes ‘gridded’ or something else? At lower RH values the distribution can be slightly more variable without condensation. As an experienced storm chaser nothing new in that video, It just says in more detail exactly what I described above. Your statement about temperature, and visible clouds also repeats exactly what I said above. When the cloud begins to form and become visible, the water vapor condenses out to microscopic droplets (too small to fall against the updraft at this point). The latent heat of condensation which is released heats the surrounding air to a higher temperature (and lower net density) than the adjacent drier air. It is thus warmer and less dense and rises. This entire process depends on the presence of water vapor, without water vapor and sufficient lifting to create condensation, the cloud would not form and neither would a persistent strong updraft. Thanks for confirming what I stated above. Humidity content alone also contributes to the lift because it causes the parcel to be lighter than a similar temperature parcel under the same conditions. This is the primary driving mechanism for a dry line storm and its development when both the dry air mass and wet air mass are at the same temperature at ground level or near ground level. Due to the humidity content of the moist air and its different lapse rate, it will be less dense at altitude than the drier air. A density difference of .7% which appears small until you recognize the huge volumes of air involved and their mass, it is plenty to begin free convection, when you are talking about parcels of air kilometers on a side the forces become very substantial. You have missed the main point of the Robinson & Catling Natgeo letter. In stratospheres IR absorbance is proportional to pressure so CO2 and other complex molecules dominate energy transfer with the result that the lapse rate is positive on most planets with substantial atmospheres. The exception is Venus which R&C discuss in their letter. In tropospheres IR absorption is proportional to pressure squared owing to pressure broadening which makes complex molecules increasingly effective at absorbing IR radiation while making them less effective at radiating energy. In tropospheres complex molecules give up most of the radiative energy they absorb to surrounding molecules via collisions. Thus the absorbed energy is retained in the troposphere with the result that adiabatic equations accurately predict lapse rates. My point is that the percentage of wv a volume of air can hold is very low, so humidity differences can not be the main factor deciding buoyancy. The CAPE calculation only compares the adiabatic lapse rate to the environmental temperature profile, no mention of humidity differences. Apparently the humidity differences can be neglected. Problem I continuously run into is that people believe the DALR and SALR have anything to say about the temperature profile of the static atmosphere. I mentioned the CO2 absorption of solar IR because CO2 is supposedly absorbing surface IR and radiating that back to the surface in the greenhouse effect theory. I don’t see how CO2 molecules already heated by the powerful solar energy can be heated again by the low power surface radiation. Pse stop using the DALR and SALR to come up with a number for the the environmental temperature profile. It just doesn’t make sense. You are missing 98.69% of the problem, discounting the density difference due to humidity and leaving out the density differences caused by the release of heat by that humidity as it undergoes phase transition to liquid water and then to ice crystals is like focusing on the trailer hitch ball,and forgetting it connects to a 5000 pound trailer. Humidity in the atmosphere is lighter than dry air, this in it self sets up density differences in the air column as you go up in altitude but that is only a very small part of the equation. If you discount all other factors that alone will lead to convection and large scale mixing due to this density difference. It is the reason, dry air fronts and air masses even with no temperature difference tend to drive under moist air mass at the same temperature like a bulldozer. ( a 1000 ft thick layer of dry air at x temp, will weigh more than a 1000 ft thick layer of moist air at the same temperature) If their air pressure is the same at the top of both layers the dry air will be at higher pressure at the bottom, and will push under the lighter less dense moist air. This causes an advancing front which lifts the lighter moist air. You get large mass movements of air driven by density differences due solely to humidity differences between the air masses and the resulting temperature and pressure profiles with altitude caused by that difference in humidity. This is where the DALR and the SALR take over. That “insignificant” fraction of the air which is water vapor holds an enormous amount of heat energy stored like a spring as latent heat of fusion (freezing) and latent heat of evaporation (condensing) Under conditions which cause the water vapor to condense to fog that moisture releases about 76x the heat energy contained in a similar parcel of dry air. That temperature change (which can only happen if the air contains water vapor) then drives the large scale convection. Humidity is like the tractor on a semi truck tractor trailer, the trailer will not move until the tractor moves. If the water fog is then lifted enough to turn to ice crystals it again releases even more energy as it freezes due to its latent heat of fusion which is 336 KJ/kg which gives the large scale convection another kick in the behind. The relationship between density and convective available potential energy shown in a skew T graph is probably the best way to “see” the effects of moisture, as you only have unstable air and large scale convection when the effects of humidity and its latent heat can push the profile into the unstable region. for how to use special marks in wordpress. ( hint: Angle brackets, not square, for starters). https://en.wikipedia.org/wiki/Bird_vision#Nocturnal_birds says owls have rods but no cones, so would see in black and white. Thanks Chief, I was going to use the angle brackets and then decided I that was HTML and not word press and I had it backwards. You’re claiming that differences in humidity will start convection, which I disputed. In reality convection starts and continuous due to density differences with the surrounding air, where the main factor deciding this density is the TEMPERATURE of the air. Obviously latent heat is needed to maintain convection, since the non-condensing rising air cools much faster than the surrounding static air (usually). So please show where in the calculation of the CAPE the difference in humidity between the rising and the surrounding static air is taken into account. The CAPE calculations I’m familiar with all use differences in TEMPERATURE. Assuming that over lakes, rivers etc the humidity is usually higher than over the surrounding land, why don’t glider pilots go looking for thermals over lakes etc, but favor dry spots like empty parking areas, rocky surfaces etc.? Nice site and much that I agree with but IMO persuading the public by having the better truth will not work. The persuading that great mass of voter to change their minds and go against authority will take truth, cleverness, humor, and luck. And I mean that. Humor and luck will be the biggest mover of the civil conscience — bashing them over the head with facts will win little. The skeptical camp requires more comedians to keep undermining the warmist arguments. And luck is needed, luck like a boatload of climate party animals scientist get stuck in the Antarctic ice. To win the public over requires people to think like an advertizing agent and not a scientist! Humor and a catchy phrase (IMO) will do more than a million pages of the finest truth. And stop thinking linear — skeptics need to refine how to make the good news into a curve ball pitch that destabilizes the warmisters. Winning an argument alone will not win the public — Skeptics need their message to go viral on facebook and twitter to start really winning — sad but true. Wrong! wrong! wrong! Just so wrong. You MUST play it as a game because that is how to get the public to watch. Play it straight and the only people there are you and the warmisters – No one else cares! So learn the tricks, stunt, and yes if need be play Bingo. But keep the public on-side. Without the public there is no winning. The truth exist, I have it, CANNOT HAPPEN; if somebody is interested in truth. Skeptics tried with their phony global warmings / coolings, sunspots and airport heat million times; when something doesn’t work for years, one tries different tactic. Skeptics have their Pagan beliefs – smart Warmist are exploiting it and are rewarding themselves with billions.